Luke Nguyen’s Pho is one of the best-tasting versions of this aromatic Vietnamese Beef Soup I’ve ever tried, but it does take a while to make. If you’ve got the time, go for it, or checkout the 2 much quicker versions below. Pho, pronounced “fuuur” or “fahr”, is a light but very aromatic beef broth, served with rice noodles, cooked brisket and slices of raw beef. It is gluten, dairy and egg free and can be served with chicken as well. 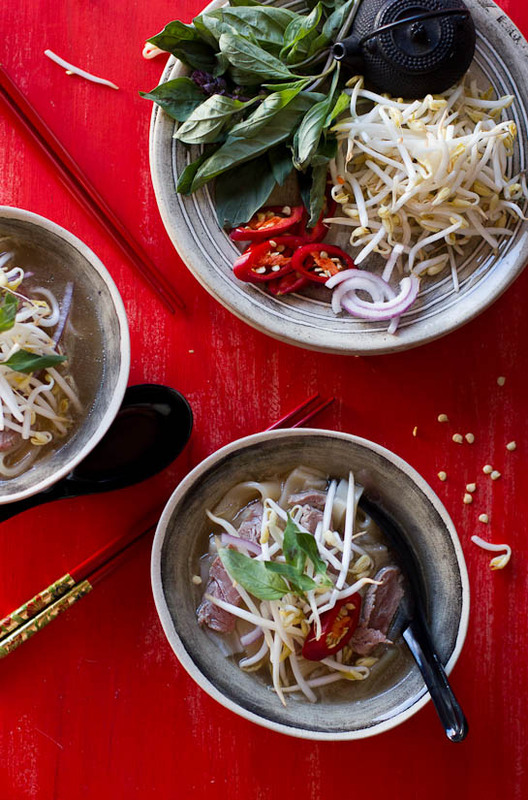 A good Pho is said to have medicinal properties almost like the chicken soup, because it contains lots of sodium, potassium and chloride – natural electrolytes. Nutrition facts aside, Pho’s flavour is heavenly. The soup is light in consistency, like a broth or bouillon, but has a rich, sweet flavour. As mentioned, it is served with a topping of paper-thin slices of raw beef and a garnish of bean sprouts, sliced onion, fresh chilli and fresh springs of Thai basil. Don’t be alarmed, or put-off by the thought of the paper-thin slices of raw meat as they cook almost instantly in the steamy broth as its poured into the bowls. Now, I have never been to Vietnam, but from what I’ve heard from those who have been and from what I know of Vietnam’s most famed dishes, I would love it there. I mean I often have Malaysian curry laksa for breakfast, so having a steaming bowl of Vietnam’s famous Pho for breaky would be quite up my alley. 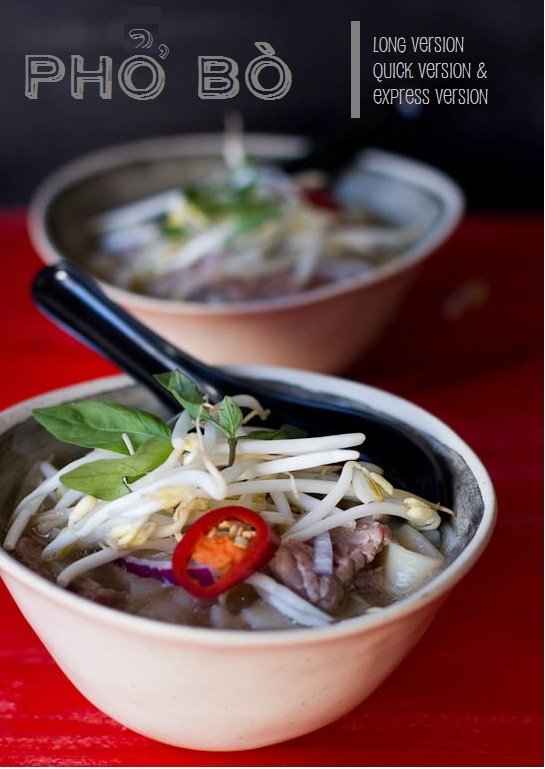 The recipe below is for Luke’s Pho (from Songs of Sapa, Murdoch Books) that takes a good few hours to make. Gluten, wheat, dairy and egg free. If you want to make a quicker version of Pho, the Essential Asian Cookbook (also by Murdoch Books), suggests simmering regular beef stock with spices (feel free to use Luke’s spice pouch suggestion below) for 30 minutes before straining, adding noodles and all the extra trimmings. Gluten, wheat, dairy and egg free. For an express 10-minute version, get yourself a Vietnamese Pho spice paste from Asian Home Gourmet, and follow the instructions on the packet. The great thing about the paste is that it is all natural and additive free but it does contain wheat/gluten. While Luke's recipe is the best I've tried, it does take a good half a day to make. 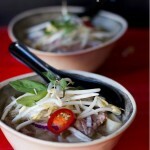 If you want to make an express version of Pho, the Songs of Sapa (Murdoch Books). Dry roast all ingredients in a small pan over medium heat until fragrant. Cool then grind using a mortar and pestle. Add the ground spices to the muslin square and tie up tightly in a knot. Set aside. In a large pot, submerge oxtail in cold water, add 2 tablespoons salt and soak for an hour, then drain. Heat a barbecue grill or pan over medium-high heat and grill unpeeled garlic, onions and ginger evenly for 15 minutes until all asides are blackened. Peel the blackened skins and discard them. Roughly chop the garlic, onion and ginger. Put the drained oxtail, beef bones, (brisket, if using), and 12 cups of cold water in a large stock pot and bring to a boil. Cook for 15 minutes constantly skimming any impurities off the surface. Reduce to a low simmer. Add fish sauce, 1/2 tablespoon of salt, brown sugar, garlic, onions, ginger and spice pouch. Cover and simmer for 3 hours, or until the stock has reduced to almost half. Strain the stock through a muslin cloth-lined sieve. Blanch rice noodles in boiling water for 20 seconds. Drain and divide between serving bowls. 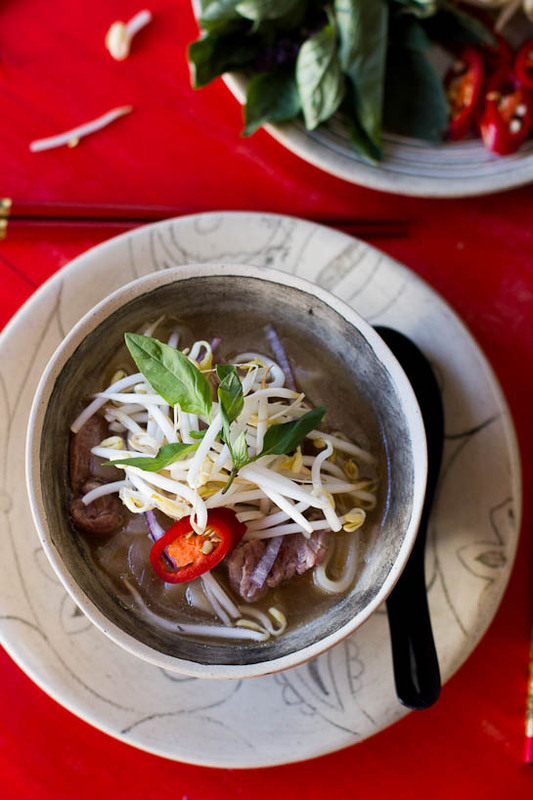 Arrange a few slices of raw beef fillet on top of the noodles and pour over hot Pho stock. Garnish with a handful of bean sprouts, sliced onion, chillies. Serve with a lime wedge, Thai basil and black pepper on the side. Harmful Food Additives and How to Avoid Them, 6 Additive-free Dip Ideas, Gluten Free Muesli and More! 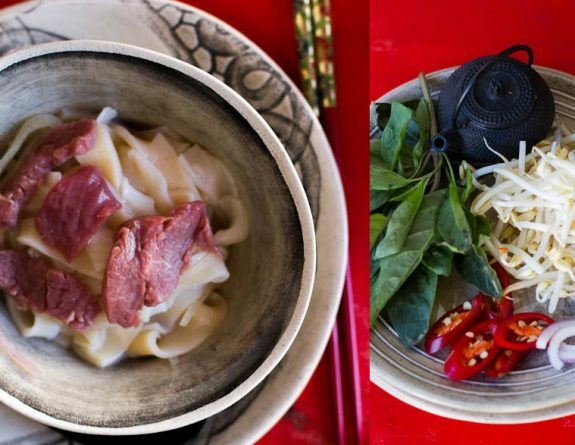 Gorgeous recipe and colours in these photos and I will definitely use Luke’s spice bag for my next Pho. Thanks for sharing. Hi Martyne, this soup is magnifique! I tried this in Vietnam and never know how to make it so this article is a lot of help. Très bien! I will make for sure. I’m ashamed to say I had pho just a couple of times on my last trip to Vietnam but what I had was sensational. Incredible, actually! Thanks for the shout out! Great post. Love a good pho! Nothing like a steamy bowl of Pho. Great recap! I love pho!!! I eat at least once a week, but I have to admit that I never made it at home…. Have to try it one day! hi martyna, do you know where they stock this packet that you refer to? i went to three different supermarkets today – two woollies and one coles and they didn’t have. 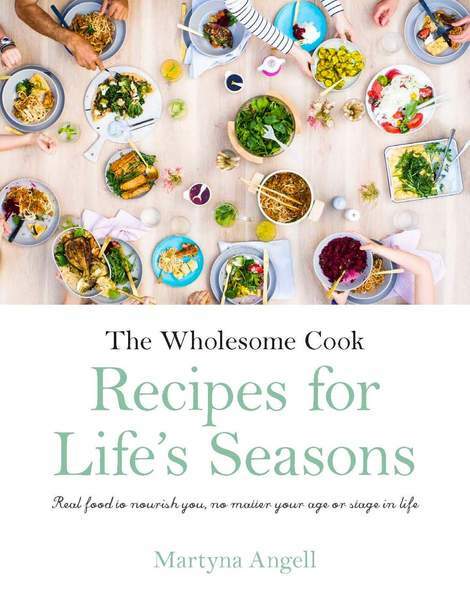 (i want to make for my husband for dinner tomorrow night but with two little people i dont have the stamina to make your beautiful looking long version!) any tips would be greatly appreciated! Hi Jen, I buy the AHG pastes from an Asian Supermarket at Top Ryde. Will send you an email with more info. I never had Pho soup, looks like i have been missing out! This looks yummy!! Was having a discussion with a friend recently about how to pronounce Pho. After Googling it, turns out we were both wrong, then within days you posted this. I haven’t ever tried Pho either, so maybe the universe is sending me a message! Must try it sometime soon. Looks totally delicious. I am such a Pho fan and have been looking in every asian supermarket for the paste with no luck. any suggestions?